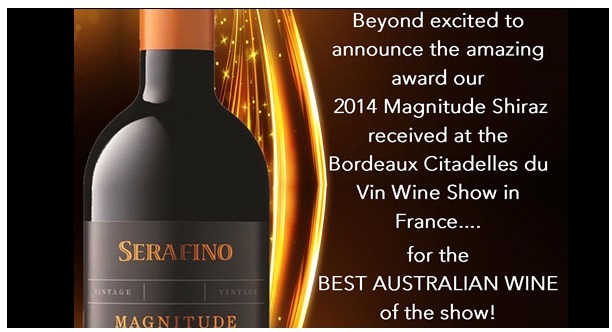 The Serafino team are beyond excited to announce the amazing award our 2014 Magnitude Shiraz received overnight, at the Bordeaux Citadelles du Vin Wine Show in France.... for the BEST AUSTRALIAN WINE of the show! Congrats to Charles, Steve, Andrew and the Serafino team . Available to purchase at cellar door. Take a read of this great article with our winemaker Charles Whish after our Magnitude Shiraz was announced the winner.